An I-Team investigation uncovered Tampa has the region's oldest ambulance fleet, with ambulances averaging 9 years old. Mayor Bob Buckhorn says he was forced to deal with losses of half-a-billion dollars in revenues and had to make do with the resources he had. 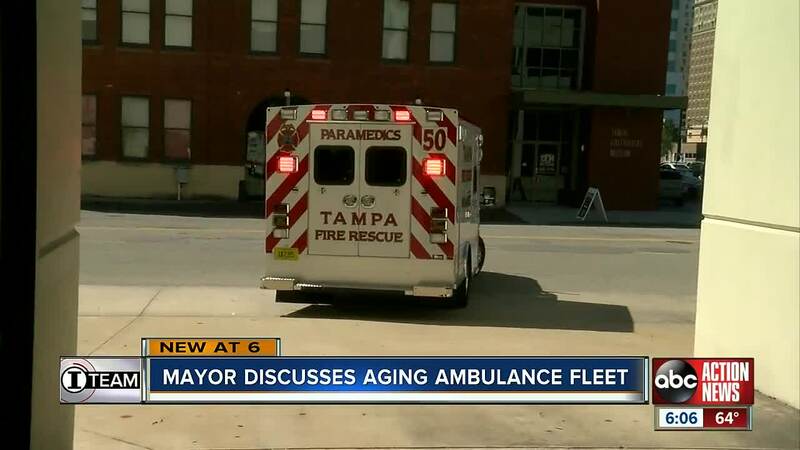 TAMPA, Fla. — Tampa’s Mayor is speaking out for the first time about Tampa’s aging ambulance fleet. The I-Team first told you last fall how a local father died after his ambulance broke down. I-Team Investigator Adam Walser finally caught up with Mayor Bob Buckhorn to get answers about why Tampa has the oldest ambulance fleet in the region. “This is a great day for Tampa Fire Rescue,” Mayor Buckhorn said at a ceremony dedicating Tampa Fire Rescue’s newest station in New Tampa on Wednesday. “There are needs, and one of those needs is the need for public safety,” Buckhorn said, pointing out that the new station would help the department improve response times in the quickly growing New Tampa community. But Buckhorn didn’t mention to the crowd what our months-long investigation found — Tampa’s ambulance fleet is the oldest in the region, with an average age of nine years. When we spoke to Mayor Buckhorn one-on-one, he said the economy is to blame for the aging fleet. But last month, the I-Team uncovered millions of dollars collected through the Community Investment Tax over more than two decades could have funded new ambulances. The largest recent allocation of those funds went to build a new 25-acre river front park. When the park opened, Buckhorn said it was a significant investment by taxpayers that would trigger millions of dollars of additional private investment around the park. “We were struggling with the loss of half a billion dollars in revenue,” Buckhorn said. When he came into office, there had not been any new ambulances put into the fleet in three years. “As mayor, you have to make these decisions. You try to give the departments what they need, it's never enough. But you do what you have to do, and you work hard at maintaining the assets that you have,” Buckhorn said. But our investigation showed the city often failed to properly maintain its aging fleet. A 2007 ambulance that is part of the fleet had 229,000 miles, was three weeks overdue for maintenance and had been in the shop 16 times in the two years before it broke down while on a call in September. The ambulance broke down outside Richard Bateman's home after the 50-year-old father suffered a heart attack. He later died, after it took nearly an hour to get him to the hospital. Richard's wife Amy Bateman wants the city to do more. “These ambulances need to be updated and maintained. They should work. They should work at all times,” Bateman said. But Buckhorn is leaving office in May, and it will likely be up to the new mayor to replace the old ambulances. “We made the decisions that we made and the next mayor's gonna have a great opportunity to add to the fleet that we have here,” Buckhorn said. We spoke to four of those candidates running for Tampa Mayor last month. Former Hillsborough County Commissioner Ed Turanchik, Tampa City Council members Mike Suarez and Harry Cohen, and retired banker David Straz are all demanding upgrades to the city's ambulance fleet.